I know many of you are waiting to see this baby's room, so I'll keep it short. A few weeks ago my friends Allison and Chris adopted a baby, and I immediately sprung into action to help Al plan a nursery. Here is what we ended up with. I think it's a pretty cute room for a pretty cute girl. We didn't have a lot of time to plan, so most of the items in the room were sourced locally or ordered somewhere online that offered quick shipping. I arrived in Atlanta on Saturday afternoon and had to leave Tuesday morning, so we had a tight schedule to get the room and crib painted, hang shades/curtains, and assemble everything. I would just like you to know that, although we achieved our goal, tomorrow I have to have my gall bladder removed. THE SACRIFICES I MAKE. The crib is a Jenny Lind, which we painted a color called "Bumblebee" from Lowes's Valspar spray paint line. (Dear Valspar, Your spray paint color selection is fantastic.) There was a communications mix-up between me and our workers (Vince) at home base, resulting in the purchase of 12 cans of spray paint requiring trips to 3 different Lowes stores. The tale of Vince and the Spray Paint is best told by Allison, so I'll leave that to her. Maybe she'll tell it in the comments. The crib bedding and lamps are from Target. The glider is from a place called, I am not joking, "New Baby Products." 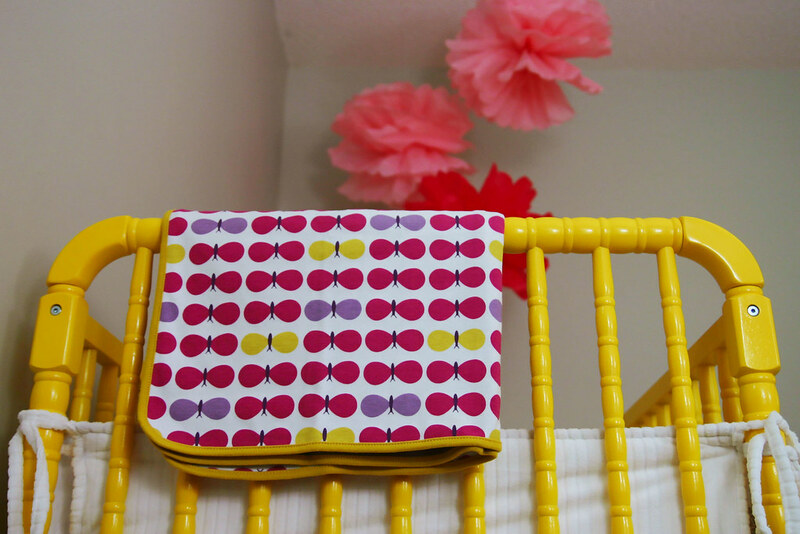 The yellow Ikat pillow is from the awesome Fabricadabra, and thank you Raina for that tip! 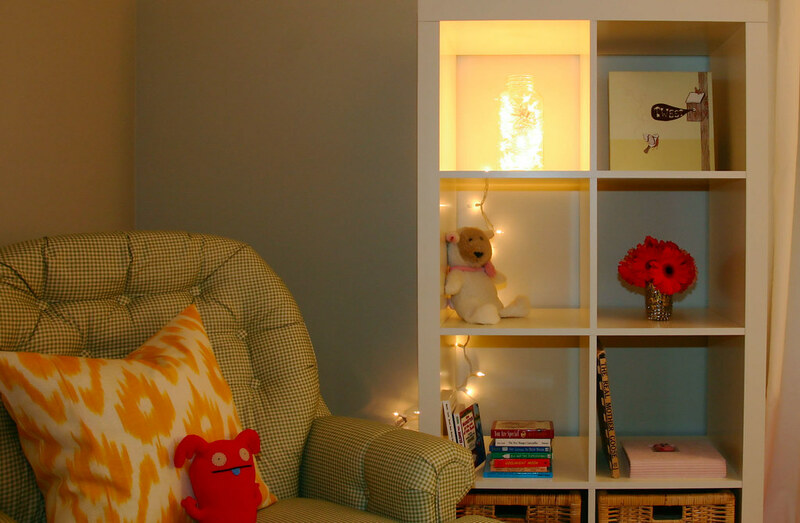 The dresser is from Babies R Us, and we love it because it doesn't look like baby furniture. The rugs, bookcase (Expedit, what what! 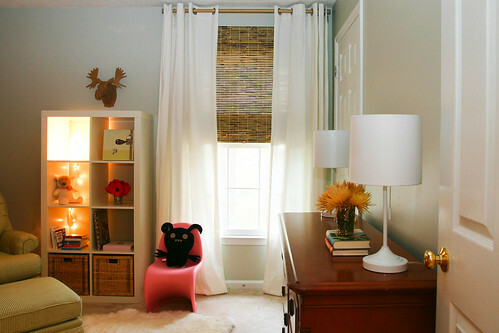 ), and white grommet curtains are all Ikea. The uglydolls are from Heliotrope Home. The pink chair is Vitra from Hive Modern. The most excellent cardboard moose head, which took me approximately 40 years to put together, is from Uncommon Goods. And finally, the walls are "Atlantic Fog" from the discontinued Martha Stewart line at Sherwin Williams. I wish I had gotten better pictures of the bed, and the room from other angles, but we woke up in the middle of a HURRICANE, so there was very little time and even less light. I did get a shot of one of my favorite things in the room, the Mason jar full of twinkle lights, which was Al's inspired idea. Welcome home, Marlo. I hope you love your new room.